So much happened during my short time in Australia that I decided to break it into two shorter posts. The first bit of my time was spent in Sydney. I stayed in Kingscross, but spent most of my time around the harbor. I got into Sydney around supper time and by the time I got my luggage and checked into my hostel I was wiped. Having just come off of finals and then traveling I was exhausted. The first night I just wandered around Kingscross and ate: saw the Coca-Cola sign and spent some time in the park. The next morning I got up and did the Bondi to Coogee beach walk. It was gorgeous. I got in the water at Bondi and spent some time just relaxing but the beach was very busy and I wanted to do the whole walk before lunch. Along the way I saw Gordon's bay, which has an underwater trail for divers! I thought that was awesome, plus the view was pretty cool. I also ran across several other beaches and watched some surfers and "bowlers." I put bowlers in quotations because it is not exactly what I, as an American, would consider bowling. But it looked like everyone there was having a great time! If you are curious it is an outdoor game and is called lawn bowls I believe. The rules evaded me even after watching for awhile, but it appears you are trying to get your ball closer to some spot than your competitors. Once I finally got to Coogee, I again spent some time on the beach before eating a late lunch and heading back to the hotel for a nice shower- thoroughly sunburnt (I did apply sunscreen, but it was either not enough or some of the large amounts of sunscreen that was recalled in NZ). I then showered and headed down by the Opera House to get some supper before the show! The atmosphere down in that area is just very relaxed and festive. The Opera House itself is just as amazing inside as it is outside. The show I saw was Gripping Shostakovic- Cello Conerto No. 1 and Symphony No.8, conducted by Vladimir Ashkenazy. While it was all wonderful, I enjoyed the Symphony much more. The next day I spent wandering around the Royal Botanical Gardens and the Rocks. The garden was huge and in full bloom! I also spent some time buying some gifts to bring back and watching some street shows. One was a trickster balancing a unicycle on a large pole and juggling (and other such stunts) and the other performance was an aboriginal preforming on his digeridoo. After it was over I spent some time talking to him, and he said he had been playing it since it was little. He handmade and painted the one he was playing on that day. I then took a sunset cruise around the harbor on one of the old tall ships. It was an enormous sailboat that was restored. They even let us look in the crew area down below, while also telling us historical facts about the city. It was a great time and I met lots of Australians and who were in Sydney on vacation. It was nice to hear their commentary on what our tour guide was saying about the city, as well as it was just a beautiful view of the bridge and opera house all lit up at night. It also just so happened that one of the deck hands had graduated from Purdue! I capped off the night with an amazing doughnut stuffed with gelato- one of the best things I've ever eaten. I then headed back to the hostel, where I went and explored a little more of Kingscross with friends from the hostel. Then it was off to Cairns. Cairns was the next stop on my Australian adventure. The town was definitely a tourist spot. It had awesome markets, including a very popular night market. The markets had everything you could ever imagine, and Rusty's market had a great fruit selection. I stayed at Calypso backpackers and it was by far the best hostel I stayed in, they always had something going on at night for free (which is perfect on a backpackers budget). The first day I got to Cairns I spent wandering around the town and swimming in the Lagoon on the back of the Esplanade. It backed right up to the ocean and was a perfect relaxing day (you can't swim in the ocean in this area due to crocodiles). There was also tons of great restaurants to choose from along this area. The next day was one of my top two days abroad: THE GREAT BARRIER REEF. We loaded the bus pretty early and set sail for the reef. It took a little over an hour to get there from Cairns, but they served us a nice breakfast on our trip and went over safety information and educational presentations about the reef. Then it was time to snorkel and dive. I had no prior experience in either, which only added to the wonder of the reef! 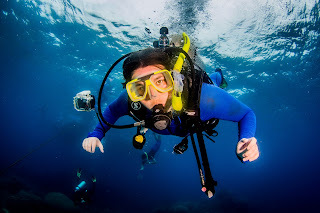 I was worried about screwing up my breathing while diving, especially since in my group (led by instructor) I was the only one who could swim so he was having to move everyone else and I was just following (props to those people for diving in the middle of the ocean not even knowing how to swim!). However, breathing through the equipment was natural and it was an amazing experience. I definitely hope to dive again, but don't know if it could live up to the GBR. I snorkeled again fro about another hour after the diving, then it was time for lunch and moving to the next spot on the reef. Here I just snorkeled for hours. Although the fish were awesome, the colors and structures of the coral were even more interesting to me. The pictures don't even come close to doing it justice. Unfortunately two of the coolest experiences I had were not captured on film. The first was a small shark species swam right underneath me while I was fixing my snorkel, but my initial freakout prevented me from snapping a picture. Then when we finally saw a sea turtle my camera had died. So while I can't show you, take my word it was pretty cool. That night I was beat. Having spent all day out in the ocean and sun, I ate showered and went to bed pretty early. The next day I took a day trip up to Kuranda village on top of a mountain surrounded by tropical rainforest. This village has an interesting history as it was originally a rather secluded aboriginal village. Then some hippies moved in and started some markets. Later they grew enough where they built a rail line leading to the village through the jungle, that they originally had to operate themselves to prove it was viable. Now it is very popular and they have added a skyrail as well! The village has lots of markets across it, and since the train was not running that day it was not very busy. This gave me a chance to talk to a lot of the locals. While it was not one of my favorite days in Australia, I really enjoyed talking to the locals and the views from the skyrail. It was VERY hot in North Queensland. However, it really was a beautiful and friendly area. I wish I would have spent more time there, but there was a lot to see and not much time! After the 3 days I headed off to Melbourne! The amazing gelato filled doughnut.